What to learn Cognos 10.2 Online? Answer : But not finding time to do the training? Do not spend much time thinking on it. BigClasses has a solution for your problem.We are giving Cognos 10.2 online training through Skype, audio sharing & video sharing. No matter where are you right now, we are here to assist you for 24×7. We are giving our Cognos online training throughout the world. We have flexible time schedule for you. We can arrange your Cognos online training class timings according to your convenience. Before knowing to our Cognos 10.2 online training course content, you need to know something about Cognos 10.2. 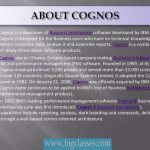 Answer :Cognos is a fragment scissored off the Latin word “cognosco,” which means “knowledge from personal experience”. 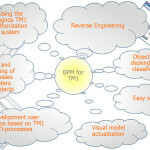 The Cognos name continues to be applied to IBM’s line of business intelligence (BI) and performance management (PM) products. IBM Cognos 10.2 delivers a revolutionary new experience and expands traditional business intelligence (BI) with planning, scenario modeling, real-time monitoring and predictive analytics. Answer :From business intelligence to financial performance and strategy management to analytics applications, Cognos software can provide what your organization needs to become top-performing and analytics-driven. With products for the individual, workgroup, department, midsize business and large enterprise, Cognos software is designed to help everyone in your organization make the decisions that achieve better business outcomes—for now and in the future. I encourage you to see this cognos video tutorial that clarifies what is Cognos and all that we have talked about in the blog. Proceed, appreciate the video and reveal to me what you think. Report Studio is a Web-based tool that professional report authors use to build sophisticated, multiple-page, multiple-query reports against multiple databases. With Report Studio, you can create any report that your company requires, such as invoices, statements, and weekly sales and inventory reports. To create reports in Report Studio, you must become familiar with the Report Studio environment.